Per il tema di oggi del Winter Nail Art Challenge ci cimentiamo negli alberi di Natale. Sinceramente non avevo voglia di fare un'altra manicure a base rossa, quindi ho sfruttato la base blu che avevo fatto per il mio compleanno (puoi vedere la mia nail art qui) rimuovendo il decoro a stamping passando delicatamente un pad imbevuto di solvente delicato e riapplicando una passata sottile di smalto blu. Con la mia base blu ho stampato dal disco Born Pretty Store BP-01 in bianco sia gli alberi che le renne come accent. Ho applicato il top coat per proteggere tutto. Questo scenario notturno e innevato mi piace tantissimo! 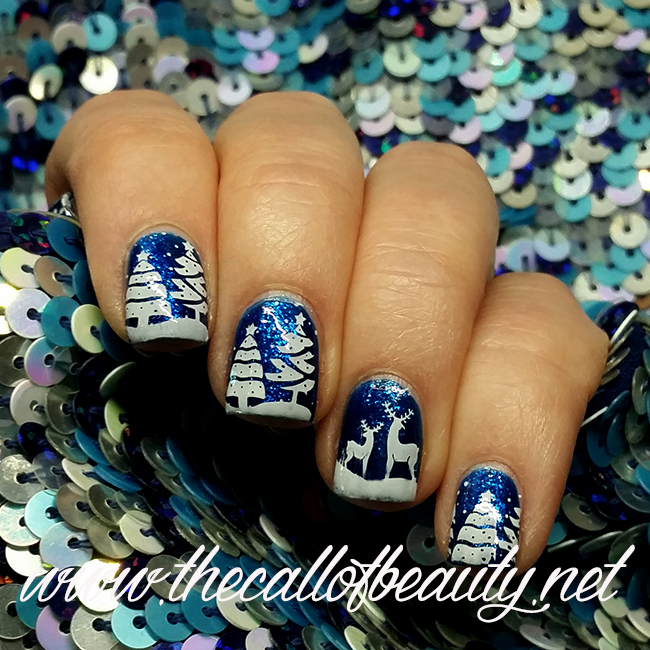 For today prompt of Winter Nail Art Challenge we are doing Christmas trees. I do not want to end doing another red manicure, so I used the blue base I got for my birthday (you can see my nail art here). I removed my stamping with a pad and a delicate solvent rubbing gently over the nails. Then I applyed just a thin coat of blue polish for my perfect base. 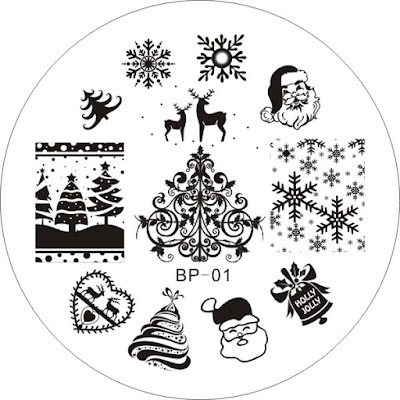 From Born Pretty Store BP-01 I stamped in white the trees and the reindeers as my accent. I applyed top coat to protect. I like very much this night and snowy scenery! 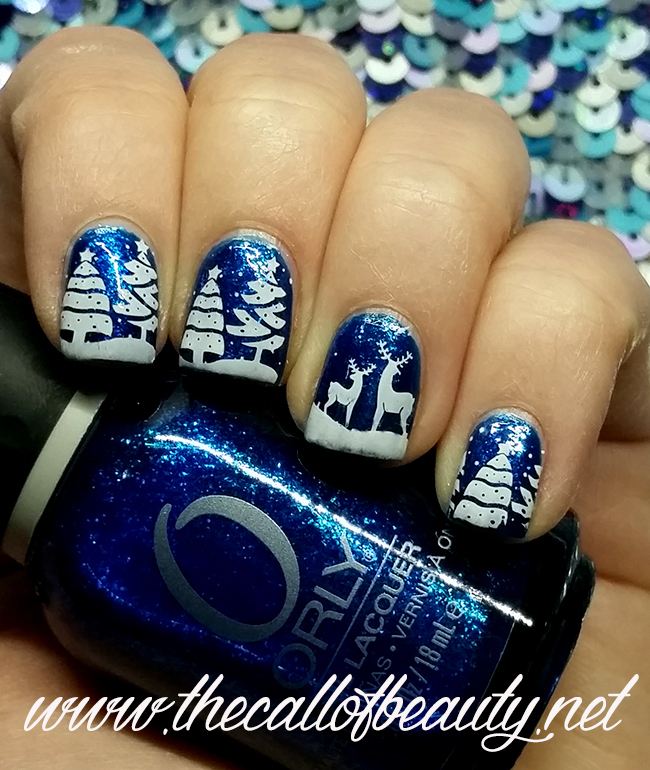 I have that stamping plate and really like the festive images on it. So pretty on your nails. Thank you, in this plate I love the snowflakes too! Stone Cold is gorgeous! It really makes the white stamping pop! Stone cold is a great base for this design too :) I can never seem to remove my stamping without removing my base... I think maybe I'm pressing too hard? I always do a layer of seche vite before stamping in case the stamping is not perfect and I want remove it. Then you can remove it with a gentle remover without acetone, sometimes the polish fades and I apply a thin layer of polish to have it perfect again! We both love colors! Thank you for stopping by today too, happy Christmas to you and your family! 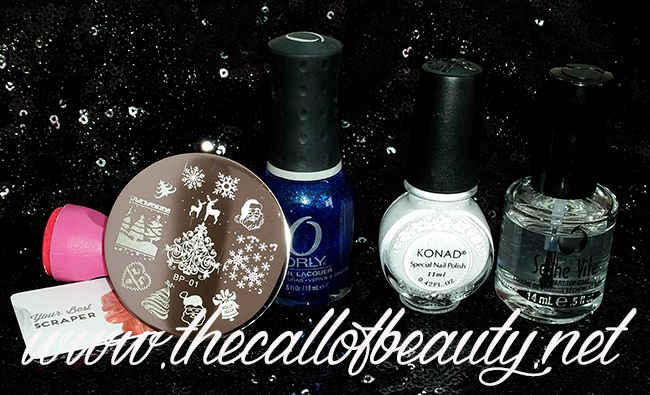 Perfect stamping and that blue is just stunning! Merry Christmas! Thank you Justina and merry Christmas to you and your family! Oh my golly this is just stunning! 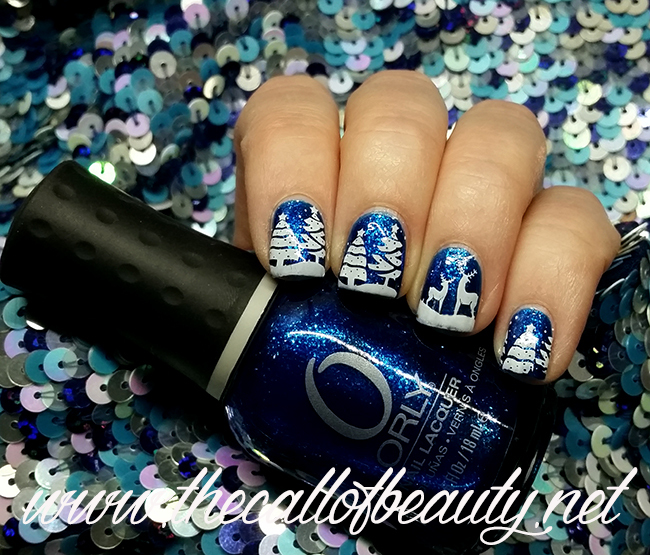 The blue, the stamping! Just stunning! Thank you so much! I'm so happy you like it! Grazie mille Barbara, sono felice che ti sia piaciuta! I have to get that plate for next Christmas! Really pretty manicure. You have to! It's sold everywhere for less than $1!